Hong Kong, China (CNN) -- Kristie Lu Stout zips all around the globe on assignment for CNN, but she doesn't have to go far to enjoy first-class cuisine, gaze at a world-famous skyline or walk the streets of a beautiful metropolis. Lu Stout makes her home in Hong Kong, China, a city as stunning by day as it is by night -- and memorable for its harbor, shiny skyscrapers and "unique blends of Eastern and Western traditions," in the words of the Hong Kong Tourism Board. About 7 million people live in Hong Kong and about four times as many visited the city last year. If you're going for the first time or returning for another visit, Lu Stout offered the following tips about her favorite Hong Kong spots. On a clear day, the Peak Morning Trail. Just walk 15 minutes around the bend from the Peak Terminal. Ride the subway. Just take a seat on any MTR train (which is always clean and efficient), plug in your earbuds, and watch Hong Kong commute away. 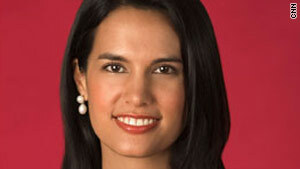 Kristie Lu Stout is an anchor/correspondent for CNN International. Wanchai. Yes, it's Suzie Wong's old 'hood. But step away from the red light district and toward the Ship Street area where to find a fabulous mix of old heritage buildings and new structures. Want to blend in? Lose the slow gait and stop staring at the skyscrapers. Walk quickly and look straight ahead. What's the biggest misconception about Hong Kong? That Hong Kong is just a city of concrete and steel ... when it has vast areas of natural beauty in its many country parks. The Foreign Correspondents Club for its high ceilings and colonial ambience, comfort food, and extensive selection of magazines and newspapers from all over the world. It's members only, so have a friend get you in. What's the biggest tourist trap? Electronics stores in Tsim Sha Tsui. Is there a "tourist trap" that's actually worth seeing? Take the Star Ferry. Be sure to board the ferry from Tsim Sha Tsui to Central at night, that way you can enjoy the dramatic Hong Kong skyline in its full neon glory. It's only a 10-minute journey, but it's one the world's greatest rides. A dinner of organic Hong Kong village cuisine at Yin Yang, followed by drinks at The Pawn. It's a former pawn shop that dates back to the 1900s that now houses an excellent bar and restaurant. Typhoon Shelter Crab at Hee Kee, Michelin-starred dim sum at the Four Seasons, egg tarts at Tai Cheong Bakery, and Hong Kong milk tea gelato at XTC. For the ladies, get your cheong sam made. A slender, form-fitting gown with a high collar -- a silk cheong sam is classic Hong Kong haute couture. Shanghai Tang offers on-site tailoring.